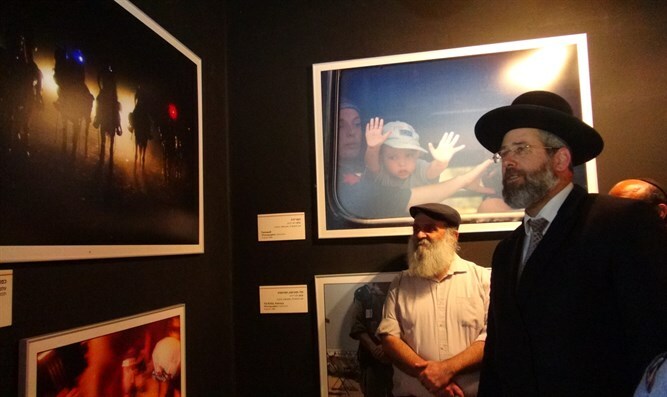 Chief Rabbi David Lau visits Gush Katif Museum, laments the thousands who lost everything they had built. Rabbi David Lau, the Ashkenazi Chief Rabbi of Israel, visited the Gush Katif Museum in Jerusalem for the first time Monday. The Gush Katif Museum commemorates the Jewish communities of Gaza which were destroyed as part pf the the 2005 Disengagement Plan, which ended all Jewish life in Gaza. Rabbi Lau strongly criticized the Disengagement. "It's sad that the situation has not changed. This is one of the disgraces of the State of Israel. People to whom a commitment was made that new homes would be built for them, and in the end were left in this situation. It's a disgrace and and a shame. I am here and again feel the pain and feeling of those days. People who lost everything they have, and yet they got up and built homes and the spirit continues."